Everyone's situation is unique, thus rendering generalizations almost useless. For a Primer on the TSP in general, please look here. For a more in-depth discussion on what options are available for your TSP funds, please look here. To bring the series of articles I've written about the TSP full-circle, I wanted to provide a specific example illustrating some of what is possible for your TSP funds. Up front, this is a hypothetical example specifically intended to highlight certain points. Of course, everyone's situation is unique and you should not act solely on what you read within this article. Rather, you should consider your personal situation and if you have any doubt, seek professional advice specific to your needs. In addition to the objective data above, our military retiree intends to do independent contract work for a few years after retirement. Then, she intends to travel extensively in full retirement and perhaps volunteer to fill-in the gaps between travel excursions. Since our retiree is in excellent health, there is no need to claim social security at 62. In general, it is desirable to delay claiming as late as possible. Simply put, the longer you delay, the greater your benefit...it doesn't get any simpler than that. Moreover, if you live past your government-calculated life expectancy, you stand to earn significantly more from the Social Security program than you would if you claim earlier than Age 70. The takeaway from this chart is that for the retiree in this example, the maximum amount of her Social Security benefits - 85% - will be taxable for her entire life under the current tax code. 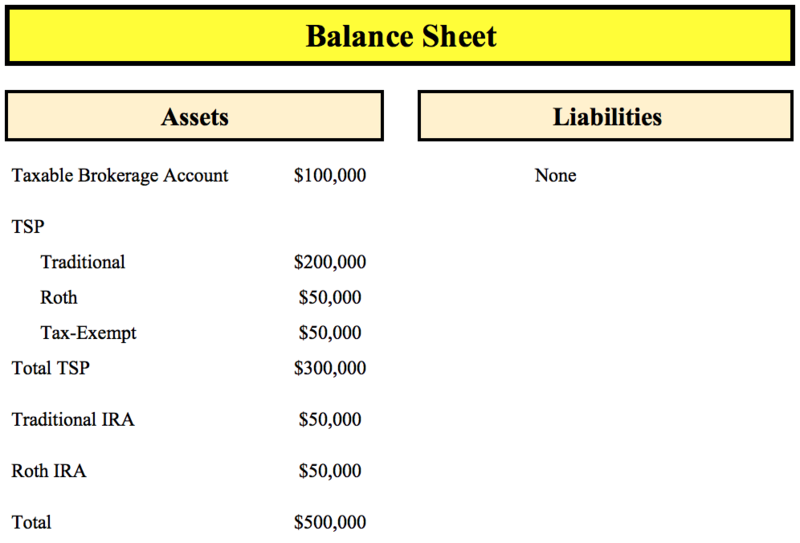 This is due to her large pension, $62,400, which is the overriding input from this chart. Of note, converting Traditional funds to Roth would have no impact on this outcome. A key takeaway from the tax structure in this case is that the retiree is always going to be in at least the 22% Tax Bracket due to her pension. 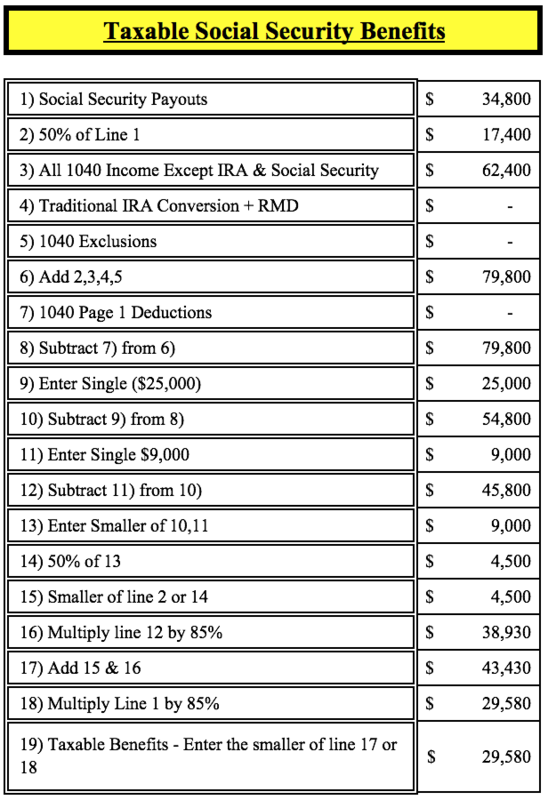 Moreover, once she claims social security, she will likely be in the 24% tax bracket ($62,400 + $29,580 - $13,300 = $78,680, leaves little RMD space before the 24% bracket), thus making conversions below that amount beneficial for her. 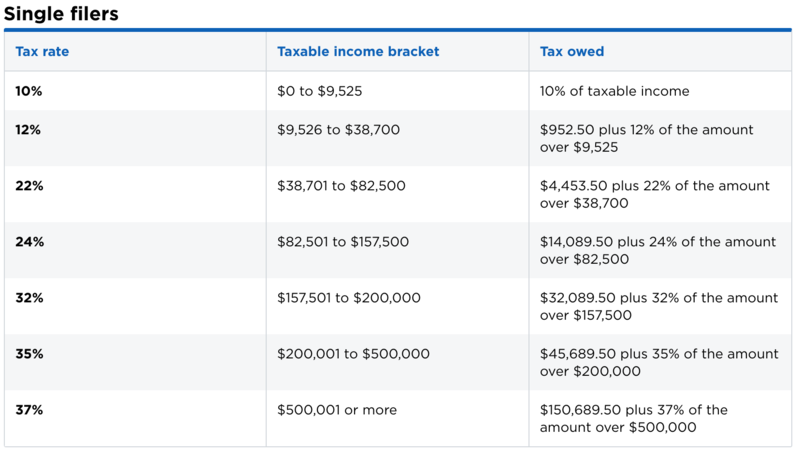 Obviously, being mindful of the upper-limit of this bracket is an important tax planning tool. Since we are already aware of the Income Tax Brackets, it is important to note the possibility of converting tax-deferred funds to a Roth IRA. Doing so takes care of the tax burden now, thus allowing for tax-free growth going forward. Moreover, it takes legislative uncertainty somewhat off the table as it is far more likely for tax rates to increase than for Roth IRAs to suddenly become taxable - though I obviously cannot guarantee that will happen. Meaning, once money gets into a Roth IRA, it is reasonably safe to assume the funds will remain tax-free. In this example, the converted funds are taxed at the advertised 22% rate. Moreover, this tactic drives down the total amount of Traditional IRA Funds, which ultimately reduces the Required Minimum Distributions necessary at age 70 1/2. For our retiree, it would likely be advisable to take advantage of the "Income Stuffing" technique for all years prior to claiming Social Security, which would have the dual benefit of a probable lower tax burden and more Roth IRA funds. Since we are considering converting Traditional funds to Roth Accounts, it is important to note that the TSP does not allow such conversions. Therefore, for our retiree, it would make sense to roll her TSP out into her Roth and Traditional IRAs respectively. Then, she could immediately begin the conversion process described above. Of note, her tax-exempt funds would roll to her Traditional account - an unpleasant outcome as the earnings generated are taxable. However, if she does actually pursue self-employment, she could form her own Individual 401(k) and roll her non-tax-exempt funds into her plan, thus isolating her tax-exempt funds. Then, she would be able to convert her tax-exempt funds to her Roth IRA. This is obviously higher-order tax planning, so before undertaking such a strategy, consult with a tax professional for specific guidance. If she is charitably inclined, she could bunch several years charitable donations into a single year via a Donor Advised Fund, which would increase her Income Tax Deductions, thus allowing for greater Traditional IRA Conversions. Indeed, Donor Advised Funds are a powerful planning tool for the charitably inclined. Once RMDs start at 70 1/2, our retiree would have the option of donating the RMD to charity, thus avoiding tax on this amount of money. This technique can only be utilized with IRA funds, not from a 401(k) or the TSP. 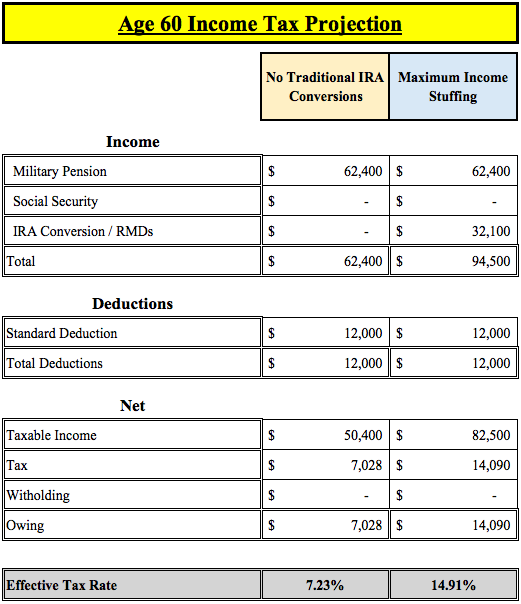 As you can see, there is much to consider when you exit the military and have a healthy TSP account. To avoid missing something, it might be advisable to consult a financial professional who can perhaps point out some areas you may have overlooked in your own planning.